Exasmoc achieved significant power savings / Tsurumi Soda Co., Ltd.
About Tsurumi Soda Co., Ltd.
Tsurumi Soda is a chemical company in Yokohama’s Tsurumi Ward that was founded in 1934. Tsurumi Soda relies on an electrolysis process to produce caustic soda, hydrochloric acid solution, hydrogen chloride, and other products, which it mainly distributes to other industrial plants throughout the Tokyo metropolitan area. The Exasmoc multivariable model predictive controller was co-developed by Shell Global Solutions and Yokogawa, and is widely used at oil refineries and petrochemical plants around the world to stabilize operations and improve productivity. Tsurumi Soda introduced Exasmoc to reduce the amount of energy consumed by the electrolysis vessels at its main plant. As shown in figure 1, these vessels separate an aqueous solution of sodium chloride to produce caustic soda (sodium hydroxide), hydrogen gas, and chlorine gas. There are several such electrolysis vessels at this plant and they are all connected in a series circuit with a constant-current power supply. Why is Exasmoc advanced control necessary? Electrolysis plants consume a lot of electricity and are always looking for ways to reduce costs by, for example, minimizing their power consumption. Tsurumi Soda operates its electrolysis plant mainly during the night, when electricity is cheaper. As the result of the joule heating effect, the temperature inside the vessels varies drastically depending on the amount of current applied during the electrolysis process. In order to prevent deterioration in the vessels’ ion exchange membranes, it is necessary to keep the temperature within predefined upper and lower limits. Furthermore, at night, when the electrolysis current fluctuates less, the temperature inside each vessel has to be kept as close as possible to the upper limit. This reduces electrical resistance and consumes less power. With the control of temperature inside the electrolysis vessels, the process dead time is 20 minutes and the time constant is 40 minutes. The temperature inside the vessels is controlled within the upper and lower limits by manipulating the temperature of the circulated caustic soda and brine solution. In order to keep the temperature within a narrow range, an advanced controller like Exasmoc is needed. 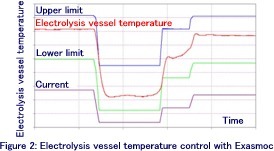 Figure 2 shows how Exasmoc controls the temperature inside an electrolysis vessel. The vessel’s temperature is kept within the upper and lower limits as the current fluctuates during the morning, afternoon, and night hours. The current ranges during the day and night are decided based on the production plans for each product. During the summer, when power consumption peaks, the local power station asks Tsurumi Soda to temporarily lower the current ranges. No matter what changes there may be in the production environment, Exasmoc keeps the plant’s power consumption at a satisfactory level. The temperature varies in each of the electrolysis vessels. Heating a low temperature vessel may cause a high temperature vessel to exceed its upper limit. Before Exasmoc was introduced, plant personnel controlled the temperature in all the vessels by monitoring just one vessel’s temperature. So, a cushion had to be added to the target temperature upper limit. With Exasmoc, it was possible to keep the target temperature inside each electrolysis vessel closer to the upper limit. This enhancement achieved a remarkable reduction in power consumption. Figure 3 shows a comparison of the average nighttime vessel temperature, with the same current applied, before and after the introduction of Exasmoc. It is obvious that, by keeping the electrolysis vessel temperature a few degrees higher, electric resistance could be reduced and power consumption reduced. The standard deviation of the nighttime temperature readings for each electrolysis vessel, with the same current applied, before and after the Exasmoc introduction, is shown in Figure 4. The graph shows that the standard deviation was reduced by more than half after the Exasmoc introduction. It means that the electrolysis vessels reached the target temperature quicker than before and that the temperature remained stable.